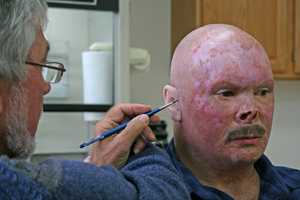 STEP 1: The creation of a custom prosthesis begins by making an impression to duplicate the affected area. STEP 2: A clay sculpture is then created to mimic the appearance of the natural anatomy. STEP 3: The sculpture is then molded and the silicone prosthesis are cast. STEP 4: The prosthesis is then hand painted to visually blend with the surrounding anatomy. On average, the silicone prosthetics creation process requires two office visits. The procedure is painless and is conducted in a relaxed office environment. The cost of our prosthetic services varies according to the complexity of the product. While the patient is responsible for payment, medical insurance often helps cover costs. Most referrals are from the medical community, news media, and television appearances. Patients can also contact us directly to schedule an appointment for our prosthetic services.